GREENGirt joins the building’s roofing and insulation system to a building structure. The structural component of the SMARTci assembly is GREENGirt, an insulated composite sub-framing girt that improves thermal performance. SMARTci completely prevents thermal bridging that are created by metal fasteners and it doesn’t create cold spots for condensation in your roof. Higher R-value without a thicker roof, using 4″ to 8″ standard insulation. SMARTci is an innovative, complete insulation solution. Engineered as a continuous insulation system, SMARTci includes composite girt/attachment members (called GREENGirt), and insulation. GREENGirt joins the building’s roofing and insulation system to a building structure. 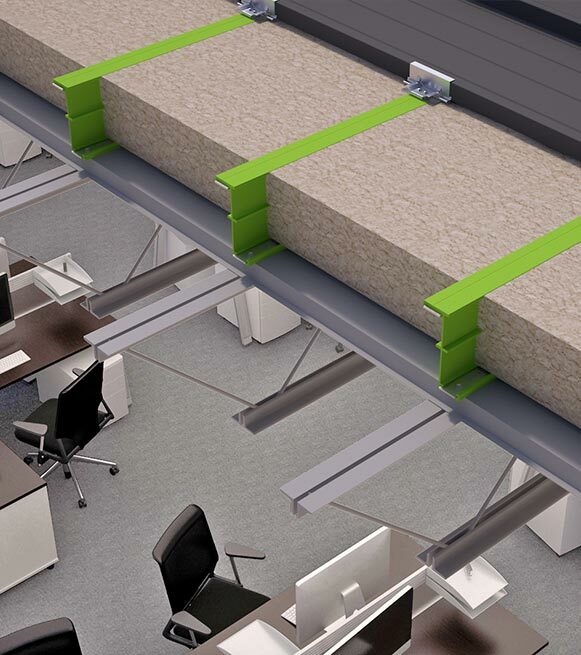 The structural component of the SMARTci assembly is GREENGirt, an insulated composite sub-framing girt that improves thermal performance and is designed to provide an insulation system free of metal-thermal bridging. By utilizing insulated composite sub framing GREENGirts, the thermal “short circuit” is simply eliminated.